Maintaining adequate isolation distances to prevent cross-pollination by crops of the same species is crucial to preserving seed variety integrity. Required isolation distances vary by species, crop type, and even variety. The distance required varies widely and is influenced by many factors in the seed production environment including pollinator density, presence or absence of plant and physical barriers, and wind direction and intensity. The available literature on determining isolation distances for seed crops is extremely varied, can be misleading, and is usually not based on sound field data. Even the best information on this subject may not be accurate for organic seed growers. Organic production systems often have a much greater diversity of insect species and an increased incidence of out-crossing in both cross-pollinated and self-pollinated species at standard isolation distances. Cabbage pinning map for Island County, WA. Photo credit: Lindsey du Toit, Washington State University. The word species means “kind” in Latin. The species designation indicates sexual compatibility between individuals. Seed growers must always be aware of the cultivars, varieties, or types of a particular species that are being grown in their region that may cross with their seed crops.In addition, it is important to familiarize yourself with related crops or weedy species that are capable of crossing with your seed crop. Examples of intercrossing crops include table beet and Swiss chard (Beta vulgaris); zucchini and pumpkin (Cucurbita pepo); and broccoli, Brussels sprouts, cabbage, cauliflower, kale, and kohlrabi (Brassica oleracea). Crops and weeds of the same species include carrot and Queen Anne’s lace (Daucus carota), as well as radicchio and wild chicory (Cichorium intybus). In such cases, the seed farmer must have an intimate knowledge of neighboring crops and the wild plant communities. The grower also should be acquainted with gardens that may have plants of the same species; a small number of flowering plants can create a large number of outcrosses. Isolation distances are largely based on each crop’s reproductive system - whether it is self- or cross-pollinated. A common misconception is that self-pollinated crops are entirely self-pollinated and do not cross in nature. All self-pollinated crops do outcross to some extent under natural conditions, but some selfers outcross to a greater degree than others. For example, lettuce and common beans outcross rarely, while hot peppers and runner beans are much more promiscuous. Much of the literature on isolation distances states that a “break” of a few feet between crops of the same species will insure adequate isolation. This information is misleading to organic seed producers; increased insect activity often leads to increased crossing rates, even in self-pollinated crops. Perfect isolation does not exist. Experienced seed growers learn that continuous checking and rouging of all genetic stocks is necessary for quality seed production. Much of the seed production literature implies that prescribed minimum isolation recommendations will eliminate any chance of an outcross and the resultant seed will be genetically pure. However, this is often not the case; there is always the chance of outcrossing, even across great distances, due to various naturally-occurring factors. Seed companies often have internal standards for purity that require greater isolation distances for “foundation” seed or “stock" seed than those used for their production seed crops. Accurately predicting minimum isolation distances can be difficult and site-specific. Isolation distances vary by density of insect pollinators, presence or absence of physical barriers, direction and intensity of prevailing winds, and acreage planted to seed crops. Numbers of insect pollinators can increase based on ambient temperature, humidity and the agro-ecosystem. Physical barriers such as terrain, vegetation, and buildings can significantly decrease the flow of pollen between crops and lessen necessary isolation distance. Prevailing winds and the physical size of the seed can also be important determinants in the amount of pollen present in areas adjacent to seed production plots. Cross-pollinated wind-pollinated species such as beets, Swiss chard, and spinach require greater isolation than most other insect-pollinated cross-pollinators. Isolation from genetically engineered (GE) crops is of crucial importance to organic producers and in other markets with low or no contamination tolerance. Organic seed producers must find out whether neighboring farms are growing GE vegetable or seed crops. When growing seed under contract, the seed buyer must be your first reference for required isolation distances. Farmers manage crop isolation distances with pinning maps (see listings by state below). In most states, these are large, wall-mounted maps housed at county Extension offices; they are available to all growers and seed company representatives within a defined isolation district. Growers and seed company representatives locate their fields on the map and mark crop locations with color-coded pins. Seed companies bear responsibility for pinning. Isolation distances are determined by agreement among seed companies based on buyer requirements. Distances are designated for each map. Responsibility for the maintenance of the maps is usually shared by personnel from Extension and participating seed companies. Participants must visit the Extension office during business hours to pin their fields. California pinning maps now are posted online (see below). Pinning map covers east Benton County, all of Linn County, and Lane County north of Creswell. Pinning map covers Marion, Polk, Yamhill, and Clackamas counties, and the far northern part of Linn and Benton counties. 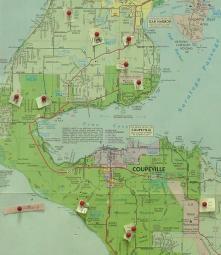 Pinning map covers Skagit, Snohomish, Whatcom, and Island counties. Pinning map covers Adams, Franklin, and Grant counties. Although Jefferson and Clallam Counties in Washington are important seed-growing areas, they do not use pinning maps. Contact Katherine Baril, WSU Extension, for locations of seed crops in this area. The California Seed Growers Isolation Pin Map System. California Crop Improvement Association and The Seed Biotechnology Center at the University of California at Davis. Isolation distances [Online]. J.H. McCormack. 2004. Saving Our Seed. Available from: http://www.carolinafarmstewards.org/wp-content/uploads/2012/05/IsolationDistancesVer_1pt5.pdf (verified 11 Mar 2010). Excellent information on factors to consider when determining isolation distances for vegetable seed crops. Knott’s handbook for vegetable growers. D.N. Maynard and G.J. Hochmuth. 1997. John Wiley & Sons, New York, NY. Pacific Northwest Extension publications on specialty seed production. See citations in General Specialty Organic Seed Production Resources.